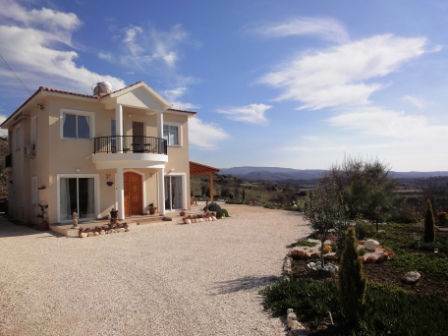 Cyprus Property Blog by Cleo : Price Just Reduced on Great Villa in Polemi - NOW SOLD! • 174 sq. m., 3 bath, 3 bdrm 2 story - €395,000 EUR - Large Plot w/ Great Views - NOW SOLD! Polemi, Paphos - This impressive villa is located on a 4311 sqm plot on the perimeter of the traditional Cypriot village of Polemi. Polemi is approximately half way between Paphos and Polis and is a thriving village with a variety of amenities such as restaurants, coffee shops, supermarkets, kiosks, banks, school, and even a small winery. Everywhere you look there are vines. It is a 15 minute drive into Paphos and for those golf lovers, Minthis Hills Golf Course is close by. A wide graveled driveway leads to the house and extends all around the property. The setting is beautiful with stunning rural views all around. As soon as you step out the car you have a sense of peace and tranquility. The ground floor features a spacious L-shaped living area which is nicely divided into distinct areas – two separate seating areas, a dining area, study and kitchen with central island and breakfast bar. Patio doors open from the dining and lounge areas on to a large covered veranda which includes a decking area with built-in hot tub. From here you can see for miles across the lovely countryside and enjoy the amazing ambiance. Upstairs there are three bedrooms all with fitted wardrobes. The master bedroom includes a dressing area, en-suite shower room and has it’s own private balcony overlooking the gardens. Bedroom 2 and 3 share a family bathroom and balcony, also with wonderful rural views. The plot is divided into 3 terraces and includes a small vineyard, a pitching tee and an orchard with a variety of fruit trees - apricot, pear, plum, pomegranates, apple, nectarines and olives. There is also a separate pergola covered with vines providing a shady place to relax, and for outdoor dining. This property is ideal if you are wanting privacy and peace, and yet do not want to be isolated. There is plenty of room to add a swimming pool if required or for extending the property further.